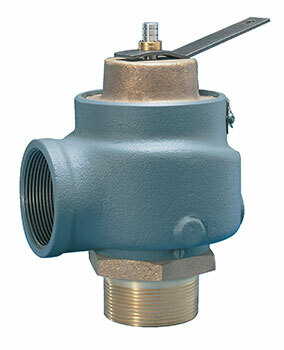 Model 930 Valve "Steam" Standard, "HV"
Applications Low pressure steam heating boilers ASME Code Section IV. Extra high capacity for industrial, commercial and residential low pressure steam heating boilers. Large seat area/guide area ratio, along with disc pivot design ensures optimum valve performance. Lapped valve seats for optimum performance. Reversible lift lever for "pull-up" or " pull-down" manual testing. All adjustments are factory sealed to prevent tampering or disassembly.